Liverpool crushed struggling Birmingham to reach the last four of the FA Cup. Sami Hyypia gave Liverpool the lead after just 55 seconds, heading in following Steven Gerrard's free-kick. Soon after Peter Crouch scored with a downward header, with the Liverpool striker side-footing home the visitors' third just before the break. Fernando Morientes scored on the hour, John Arne Riise's drive made it 5-0, with Olivier Tebily's own goal and a Djibril Cisse shot completing the rout. Those last two goals summed up just how poorly Birmingham played, with Tebily's scuffed clearance ending up in the net, while Maik Taylor somehow allowed Cisse's shot to slip under his body. 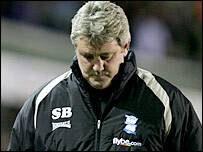 The manner in which Liverpool embarrassed Birmingham defensively will leave huge question marks over the ability of Steve Bruce side's to stay in the Premiership. Bruce replaced defender Martin Taylor, culpable in Liverpool's first and third goals, with Tebily at the interval, but the switch failed to stiffen Birmingham's defensive resolve. Liverpool's biggest ever FA Cup away win also marked the return of Mohamed Sissoko, who was playing for the first time since he suffered a serious injury in the Champions League game against Benfica last month. The Liverpool midfielder was quick to make his mark, flicking on Gerrard's free-kick for the unmarked Hyypia, who guided his header past Taylor. If Birmingham's defence went missing for that goal they proved similarly lax for Crouch's first goal on five minutes. After Gerrard crossed from the right, Crouch was allowed a free header - an effort that Taylor managed to initially block - before the ball trickled over the line after hitting the Birmingham goalkeeper's back. Soon after, Gerrard delivered another cross from the right for Crouch, but this time Mario Melchiot managed to get to the ball ahead of the Liverpool striker. Eight minutes before the interval Birmingham's defensive failings were exposed again as Luis Garcia shrugged off a series of challenges, before passing to Crouch who side-footed past the Birmingham keeper. In the remaining minutes of the first half Crouch had another couple of chances, first with a low shot and then a header. Amid this Liverpool onslaught Birmingham's best two chances stemmed from Jermaine Pennant crosses. On the first occasion, Jamie Carragher showed immaculate timing to take the ball away from Mikael Forssell, while the second time Jose Reina palmed the ball away from the Finnish striker. Just before the hour Liverpool added a fourth, Garcia's intelligent dummy freeing Gerrard, whose cross was neatly converted by Morientes. Liverpool's fifth came from Riise's stunning shot, and Birmingham's misery was completed by Tebily's own goal and Cisse's shot that Taylor fumbled. Birmingham: Maik Taylor, Melchiot, Cunningham, Martin Taylor (Tebily 45), Painter, Pennant, Johnson (Bruce 75), Clemence, Clapham, Forssell, Dunn (Kilkenny 71). Subs Not Used: Vaesen, Lazaridis. Liverpool: Reina, Finnan, Carragher, Hyypia, Traore (Kewell 22), Alonso, Gerrard (Cisse 71), Sissoko, Riise, Crouch (Morientes 56), Luis Garcia. Subs Not Used: Dudek, Kromkamp. 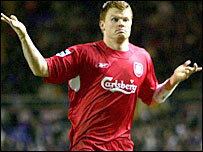 Goals: Hyypia 1, Crouch 5, 38, Morientes 59, Riise 70, Tebily 77 og, Cisse 89.